My mom once tried to set a limit on the amount of time I spent watching TV. Indignant, I just about threatened to organize a march on Washington. Armed with no scientific studies or even parental playground chatter about the potential harm of watching thousands of hours of moving images per year, she caved. That was the early 1970s. Today, when it comes to setting television limits for my own daughter, allowing her unfettered access to TV seems about as rational as buying her cigarettes. Times, naturally, change. Or do they? As any parent with a middle-schooler knows, kids today carry their TVs with them -- all day, every day. And not just TVs -- movie theaters, libraries, arcades, newspapers, magazines, friends family, and strangers, too. Smartphones. They hold more potential distractions than a carnival. And more potential for family conflicts, as well. That's the subject of "Screenagers," directed by Delaney Ruston, a primary care doctor and filmmaker who took up the topic in the midst of conflicts over screen time in her own family. In the film, Ruston discusses the issue with parents, academics, mental health professionals and kids, including her own, in an attempt to get a handle on the enormous shift taking place in how tweens and teens interact with the world and each other. You won't find the movie in theaters or online. Instead, "Screenagers" is being licensed to schools and groups around the U.S. in hopes of fostering community-wide discussions. Ruston appeared on KQED Newsroom last Friday to discuss the film and the issue of kids and screens. (See the video below.) Afterward, she told me the genesis of the film was the conflicts she was having with her kids over the amount of time they devoted to electronic gadgets. "There was anxiety and tension that I was feeling daily with my two teenagers, who were suddenly wanting more and more screen time, in a way that I felt out of control," she said. "I was getting so mad at them, and then feeling incredibly guilty about the way I acted." Smartphones have become so affordable, it's now commonplace for even sixth-graders to carry them all day. Policing what kids do online is increasingly difficult, because they routinely do their homework on computers. "Which ultimately equates to Internet, video games and TV and everything else," Ruston said. Meaning, kids often keep multiple tabs open and do their work simultaneously with other activities. "Knowing that, parents are suddenly feeling bombarded." In the face of this ubiquitous allure of the online world, many parents have given up, Ruston said. "So often I would hear parents say, 'Cat's out of the bag, really nothing I can do.'" Another rule: Don't be a hypocrite -- which is how one study found many kids think of their parents when it comes to screen-time rules. "They can't help themselves from imitating a lot of what we do," Ruston said. For example, if we're checking our phones at stoplights, and then we try to drill into our children not to text and drive, that is not going to be effective. 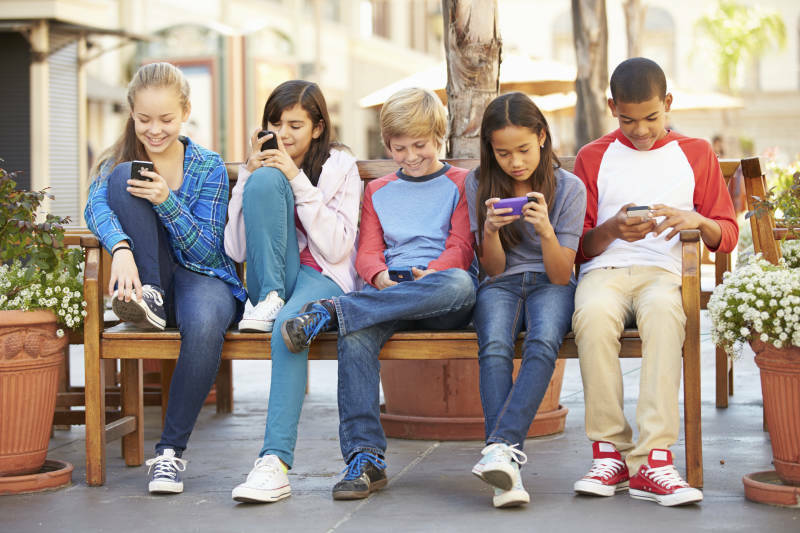 A report last year by Common Sense Media, a nonprofit organization that focuses on kids, media and technology, said 57 percent of 13-to-18-year-olds spend more than four hours per day in front of screen media -- TV, movies, online videos, and social media. The daily consumption of 8-to-12-year olds is about four-and-a-half hours. Still, you may be surprised to find not everyone is even convinced lots of garden variety TV is a bad thing. And when I asked Ruston what the studies say about the current levels of electronic immersion, she said "not a lot of research" has been done on just how much is too much. A study that found sixth-graders who took a five-day break from their smartphones could read social cues substantially better than a control group. A study that found university students who had to sit quietly without their mobile devices becoming progressively more anxious, with more anxiety experienced in those who used the devices more heavily. But in Ruston's opinion, we don't need a team of researchers to validate the common sense conclusions of what parents have been observing in their kids. “I think we already have enough data," she said. "When we see our kids building something super cool, or talking to their grandparent and having a deep conversation, or struggling to make something and they make it, those things warm our heart. When we see them on the screen, we don’t get that." By the way, the annual Screen-Free Week, sponsored by Campaign for a Commercial-Free Childhood, starts May 2.